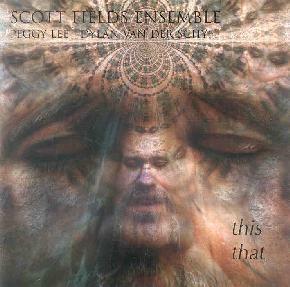 Scott Fields Ensemble - "This That"
This That is a powerfull set of sonic mayhem, melodic avant garde jazz, and chamber music experimentations. The lineup of the Ensemble is apparently in continual flux, this recording consisting of Fields on guitar, Peggy Lee on cello, and Dylan van der Schyff on drums. From the opening 14 minute track, the musicians come roaring out of the starting gate and assault the listener with a noise-fest that thankfully stops short of making the instruments indistinguishable from one another. After several minutes the trio eases the pace and calms the aggressive sounds dramatically, lulling the listener for a couple minutes until blasting off into an avant-rock and jazz symphony of beautiful chaos. This is my introduction to Fields' music and I'm mightily impressed by his playing. The best moments are when rapid-fire guitar licks duel with Lee's cello, shifting continually between noisy aggression and quiet but intricate avant-jazz runs. In fact, listening to the music on This That I assumed that most of it was completely improvised until reading in the promo sheet that Fields instead "relies on controlled variation of structure, pitch groupings, texture, and other musical characteristics as frameworks for improvisation". The trio excel at both heavy brain crunching assaults and tightly focused excursions that focus as much on the sounds they produce as the musical whole. "This Is That" is a standout track in this regard, sounding like a chamber trio doing a Carl Stalling tribute. The relatively short "That Is This" is a blistering rocker that's like Mahavishnu Orchestra gone acid free-jazz. Excellent playing from all three musicians and lots of good ideas and themes that are carefully developed, making for an enjoyable ride through the more accessible side of what many would consider abstract or "difficult" music. For more information you can visit Scott Fields at this web site at: http://www.scottfields.com/. This That is distributed by Accretions. You can visit their web site at: http://www.accretions.com.